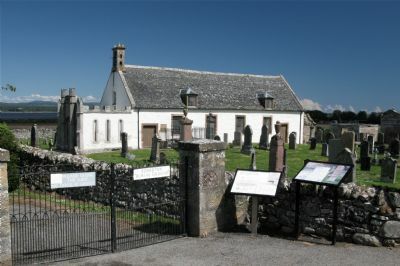 Edderton Old Parish Church in Easter Ross lies about a mile east of the village of Edderton on the north side of the A836 and not far from the southern shore of the Dornoch Firth. Built in 1743 on a much older religous site, it is quite unique in being little changed both internally and externally since the interior was re-modelled in 1794. Its significance has been recognised by Historic Scotland with the Church's listing being revised in 1997 from Grade 'B' to Category 'A', i.e. to a building of national, or international importance. This long, low and simple building, set in its dry-stone walled churchyard is indeed an exceptional survivor, and well worth a visit. The Church is open for viewing from April to September, between 2pm - 4pm on the first and third Saturday of each month.